Hi, I am Janneke and I’m from the Netherlands. I’m a Dragon speech recognition software expert. 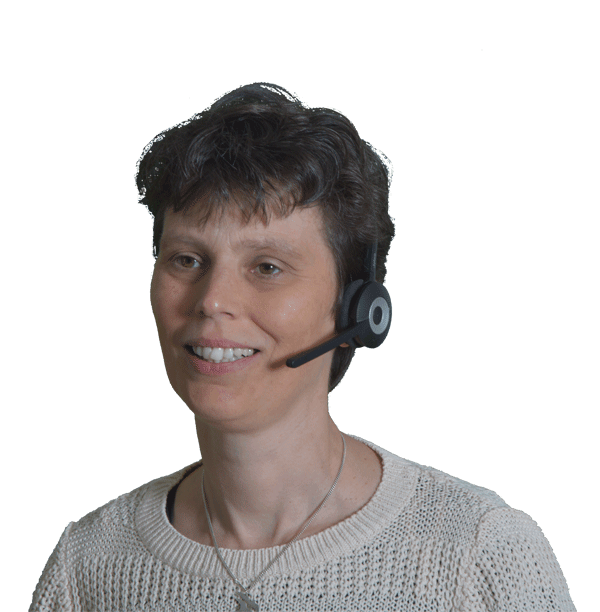 My job and my passion is to help people learn to use Dragon to dictate their texts and operate their computer by voice. I’m married, we have a cat and in my free time I enjoy reading and pottering in my vegetable garden. I’ve also been singing as an alto in various chamber choirs for the past 30 years (eek, I’m getting OLD!). It took a while for me to find a career that would suit me. After a false start as a secretary (really, don’t ask), I got an education to become a computer network engineer. I found a job at the IT department of a telecom company and I enjoyed my work. The year was 1997 and Novell was still in business. But then I started to get problems with my arms. This was caused by an unhappy combination of the type of work that I did and the way my body could not handle that. The direct trigger was a stint with a grass strimmer (you know, the spinning wire things). All of a sudden, I dropped some cutlery without meaning to. And I experienced a stabbing pain in my arms. It didn’t take long for the problems to cause significant discomfort during work. I saw a physiotherapist, but the treatment didn’t help. The occupational health doctor told me to just get on with the job and not bother them. The compaints were too vague; I wasn’t taken seriously. So I struggled for another 18 months, until I was in pain constantly. I couldn’t even wipe my buttocks or brush my teeth without experiencing extreme discomfort. If I sat at a PC, I’d be in pain after 2 minutes and had to guide the mouse with both hands to get it to the desired spot. To be honest I don’t enjoy going back in my mind to that time and recalling how I felt. Those were difficult days for sure. By that time, the term Repetitive Strain Injury hand become a ‘thing’ and I had it. It had become impossible for me to work. Blessedly, the Netherlands have a fair system for these situations, so my employer had to do significant effort to help me get back to work and I didn’t loose my entire income. However, after a year I still wasn’t able to go back to my old work full time. I got a 50% job at the IT helpdesk while all of us were trying to figure out a better solution for me. Eventually I was declared unfit for any IT work and I was told to find another sort of job altogether. I was 28 years old and my chosen career had ended. Now how to find a decent job where I wouldn’t need my hands. Either for computer work, or for more manual work. It did not seem feasible. In the meantime I had discovered speech recognition software. I had gotten IBM VoiceType, which offered word-by-word slow dictation with very mediocre recognition rates. Also, It was in English and I was Dutch. Still, it gave me access to the computer and do some things that I otherwise couldn’t. A bit later I also got DragonDictate and I became quite good at creating commands to navigate the computer by voice. However, these were in English and I couldn’t do regular work with these programs in Dutch. And then in the year 2000, we got Dutch speech recognition software! And there was something to choose from: In a short period of time Dragon NaturallySpeaking, Philips FreeSpeech and L&H VoiceExpress became available. I borrowed money to purchase a more powerful computer and also bought all brands of speech recognition and became proficient at them. I started thinking about setting myself up as a trainer, but was really scared to become self employed. I’d just experienced how important the employee protection was in times of disaster. Fortunately, there was a company hiring a speech recognition trainer and I got that job! For 11 years I was an employee there and things were mostly good. The software tech side of the job spoke strongly to the geek in me. Also I truly enjoyed the training aspect: each client had individual needs as to what programs they wanted to control by voice and type of vocabulary that they use. Over time I have trained people from age 9 to 80 and in all types of professions. Healthwise, I never really recovered from the RSI, due to underlying physical causes. So it was just as well that I had a position, doing work that I could do with Dragon. All those years I happily traveled to clients for 1-on-1 training and did sales and support from the office. And then disaster… or not? And then, in 2009, I heard that I was to be fired. Not only me, but also my two colleague trainers. The company was in dire straits and we had to be ‘let go’. It didn’t take long for me to decide that, this time, I was ready to start out on my own. With some luck and a lot of persistence I started my own business in April 2010. To my own surprise, I really enjoyed being my own boss! And even though the financial climate wasn’t that great for starting a new business, I did hang in there and beat the odds. I’m not sure what percentage of failed new businesses is, but eight years later I’m still there, running a succesful business. A few years ago I started getting serious about developing an online course for learning how to use Dragon NaturallySpeaking. One of the things that I wanted to provide, was continued help for my clients. In my one-on-one trainings I can address many of those challenges, but who would help them after I had left? One or two sessions of a few hours each isn’t enough for everyone to get enough of a foundation to get the most out of Dragon. My thought was that an online course would allow people to get an introduction into using Dragon. Any exercises and videos in the course could be repeated as often as they’d need to, unlike my life one-on-one trainings. However, the power of the one-on-one trainings was being able to cater to the individual situation of each client. An online course could never hope to aspire to that level of customisation. So I decided to create, not a course, but a membership site. In the Dutch Speech Recognition Academy, I created opportunities for members to ask their questions whenever they had an issue with using Dragon. After a few starts and stops, I finalised the Dutch version of the Speech Recognition Academy by the end of 2016. Currently, the Speech Recognition Academy offers a signature course to learn the basics of Dragon. We have monthly live Q&A’s via Zoom and also the forum where members can ask their questions 24/7. In April 2018, the Learn Dragon Online Academy has launched. Yay! I’ve now been making my online courses on learning how to work with Dragon available in English. And, as ever, I place great value in being able to support members with their individual challenges while implementing Dragon in their computer work. So the montly Q&A’s and forum also form an important part of the LDO Academy. Find out more about the Academy if you’d like help with using Dragon. You’ll find courses, short tutorials and you can ask questions in the forum! If you sign up fpr the free membership, you can get started with learning about using Dragon (NaturallySpeaking) speech recognition.